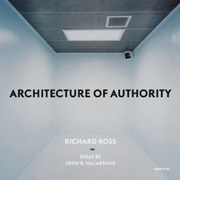 For the past several years and with seemingly limitless access, Richard Ross has been making unsettling and thought-provoking pictures of architectural spaces that exert power over the individuals within them. From a Montessori preschool to churches, mosques, and diverse civic spacesa Swedish courtroom, the Iraqi National Assembly hall, the United Nations the images in Architecture of Authority build to ever harsher manifestations of authority: an interrogation room at Guantánamo, segregation cells at Abu Ghraib, and finally, a capital-punishment death chamber. Richard Ross: Photograph as Empty Stage and What’s Next from Aperture Foundation on Vimeo.